Bateleurs are a frequent sighting at Thanda Safari. These beautiful, medium-sized Eagles are quite colourful. This pictures, taken three days ago, show the scavenging nature of these birds. The female picked up a small rodent carcass and flew to a tree perch to have her dinner in peace and quiet. Sightings like these are the reason, why every Safari-goer should always take a set of good binoculars onto a trip! 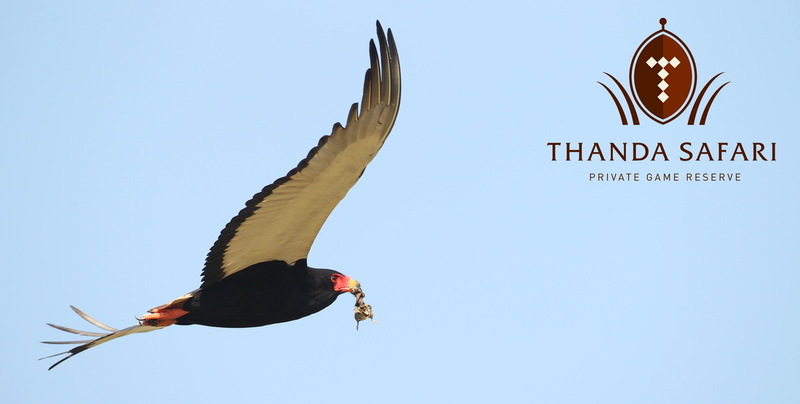 .. the Bateleur has a very short tail which, together with its white under-wing coverts, makes it unmistakable in flight. The tail is so small that the bird’s legs protrude slightly beyond the tail during flight. They are hunters and scavengers. “Bateleur” is French for “street performer” which included performers such as tight-rope walkers. This name implies the bird’s characteristic habit of rocking its wings from side to side when gliding, as if catching its balance.